Some MOSFET's BS170 requires a resistance from source to gate. It should be approx.3kOhm and needed to be individually selected. Coils on ring T37-6 are tuned for resonance , then TX signal is clear.Output power is abt 50mW ,if my power meter shows correctly. It easily lights LED , telegraphing tone also is clear. In this project, you will make a simple low-power broadcast-type circuit, using a crystal oscillator integrated circuit and an a collector modulated AM oscillator. Normally these designs have only two transistors. 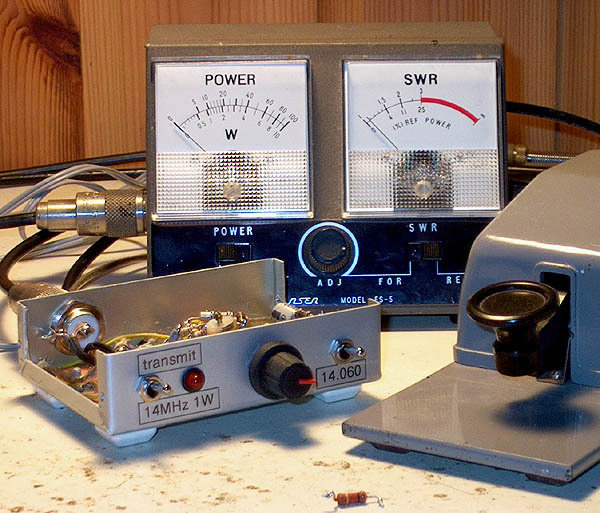 A good example is My first QRP rig that can be found somewhere else on this site. 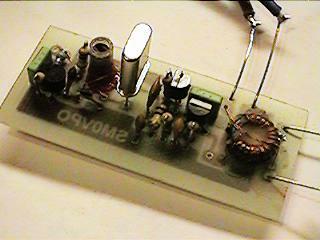 Here the VXO (Variabele X-tal Oscillator) has a tuning range of 16 kHz. This project is relatively simple to construct, and will give a "presentable" SSB signal on the lower HF amateur bands. This project has two different inputs, one for 600Hz FSK and one for keying the oscillator. It is based upon a crystal so the HF stability is excellent.